The election process of the Central President and the nomination of the Secretary General of Bangladesh Islami Chhatra Shibir for the session of 2017 has been successfully completed. Yasin Arafat has been elected as the Central President for the next session based on the votes of members throughout the country online while Mobarak Hossain has been nominated as the Secretary General. This result was declared today, on Wednesday, the 29th of December, 2016, by Assistant Election Commissioner and ex-Central President of Chhatra Shibir, Motiur Rahman Akondo. The name of the newly elected Central President was declared at a meeting of the Central Executive Committee of Chhatra Shibir at Shaheed Abdul Malek Convention Centre. After the declaration of the name,the Assistant Election Commissioner Motiur Rahman Akondo administered the oath to the new Central President. Earlier, the voting process for the election of a new Central President by the members of the organisation was carried out online throughout the country on 27-28 December. The results were declared following vote counting after the end of the stipulated voting period. The newly elected Central President, as per the rules of the constitution, convened with the the Central Executive committee members and nominated Mobarak Hossain as the Secretary General for the session of 2017. The newly elected Central President had previously served as the President of Dhaka City East, then later Central HRD Secretary, Literature Affairs Secretary, Office Secretary and latest as the Central Secretary General for the 2016 session. 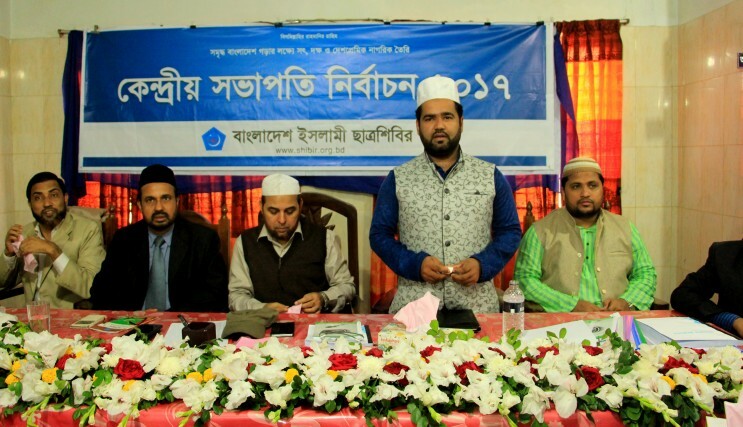 The newly nominated Secretary General had previously been the President of Rajshahi University unit of Shibir, after which he served in the roles of Central Education Secretary, Central Literature Secretary and latest as the Central Office Secretary of Chhatra Shibir. It is mentionable that the newly elected Central President has completed his Honours and Masters from Dhaka University, and is now enrolled in an M.Phil. programme at the same university. On the the other hand, the Secretary General completed his BBA from Rajshahi University, and is currently a PhD researcher. At 11 am today, he was administered the oath by Assistant Election Commissioner and ex-Central President of Chhatra Shibir Motiur Rahman Akondo, at a meeting of the Central Executive Committee of Chhatra Shibir at Shaheed Abdul Malek Convention Centre in the capital. Among the attendees present in the meeting were ex-Central Presidents Nurul Islam Bulbul, Selim Uddin and Abdul Jabbar, along with the members of the Central Executive Committee.